Explore the Tindaya Mountain Protected Landscape in Fuerteventura. 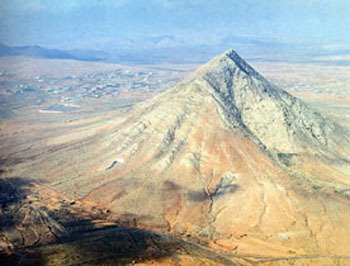 The Tindaya Mountain is located in the municipality of La Oliva in the north of Fuerteventura. This appealing mountain belongs to the Dunas de Corralejo Natural Park. Here many old domestic tools were found as well as many religious inscriptions and burial constructions. The Tindaya Mountain has one of the most important cave art manifestations in the Fuerteventura island. According to the guanches, this was considered a magical mountain. This site has great vegetation mostly formed by bushes and hawthorns even though on this park you might find a good representation of the natural resources in Fuerteventura. Here you might also a great cultural attraction as it has a great piece from Eduardo Chillida, one of the most important sculptures from his time. Due to all these reasons, Tindaya Mountain is considered an important symbol of Fuerteventura. Due to the fact that Fuerteventura is one of the islands with more active tourists, Tindaya Mountain receives thousands of visitors every year.